Fact: during final exams, students run on a minimal amount of sleep. Fact: during finals, they also tend to consume the maximum amount of caffeine. Fact: they also consume the absolute minimum amount of "real food". I know this from the experience I had throughout the past week cramming for exams. It seemed that if it wasn't microwavable or eatable directly from fridge, it was a no-go for I had studying to do. 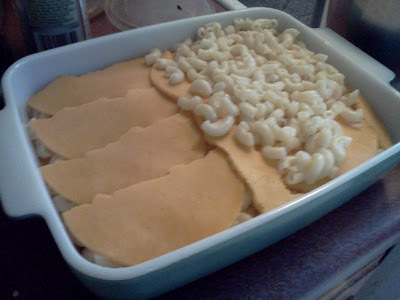 Tuesday night, however, I managed to pull together some "real food" with the help of my handy dandy Pyrex and Grandma's knowledge. 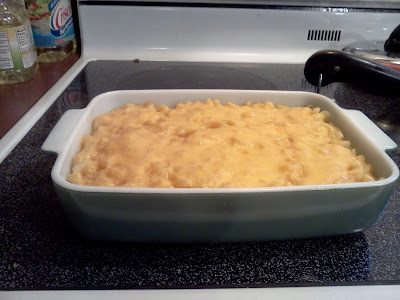 Meet the homemade macaroni and cheese which was my savior. Although mine wasn't as good as my grandma's, it was still quite yummy. But then again, I don't know if anything can top a grandma's cooking. This looks SOOOOO delicious! What kind of cheese do you use?